(Beijing, 7 July 2013) A Forum dedicated to cooperation between local governments of China and the countries of Central and Eastern Europe was held in the Chinese city of Chongqing from 1 to 5 July 2013. The Serbian delegation headed by Milomir Premović, deputy of the National coordinator for the China - CEE cooperation and Special Adviser to the Prime Minister of Serbia. Beside him, the delegation included Mayor of Leskovac Goran Cvetanović, Assistant Mayor of Novi Sad Vanja Vučenović, President of Regional Chamber of economy Subotica Slobodan Vojnović, Deputy director of Vojvodina investment promotion Milana Milić, Director of the Tourist Organization of Leskovac Žikica Nestorović, President of Municipality of Raška Jovan Čorbić, Vice Mayor of Kruševac Siniša Maksimović and economic representatives from several companies, as well as representatives of the Embassy of the Republic of Serbia in Beijing. The Serbian delegation participated in several panel discussions in which the possibility of expanding cooperation between Chinese cities and provinces and 16 countries of CEE was discussed. The head of Serbian delegation M. Premović gave several interviews - to China Radio International and local media - highlighting the good relations between Serbia and China and the successful cooperation in the field of infrastructure. 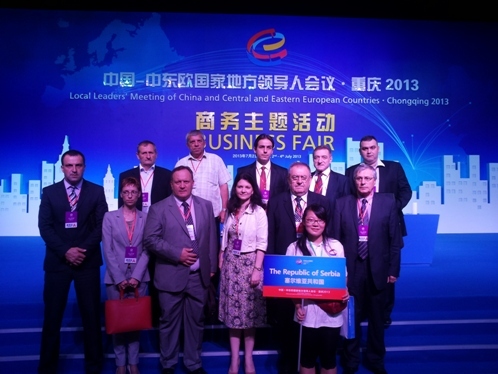 During the Forum an exhibition devoted to each of the 16 CEE countries was organized. The Serbian pavilion was very well attended.